The beleaguered manufacturing sector got more good news as factory orders increased in January for the sixth time in seven months. Commercial aircraft led the growth, according to the Commerce Department, and non-transportation orders gained for the third month in a row. Hampered by weak global economic growth and the strong dollar, factory orders had declined to five-year lows in 2016. A proxy for business investments rose for the third consecutive month but remained near their levels just after the 2008 financial collapse. Some economists say greater business investment could help moribund labor productivity. The gap between what the U.S. sells abroad and what it buys from other countries widened in January to the biggest gap in nearly five years. The trade deficit jumped 9.5% to $48.5 billion, the highest since March 2012, according to the Bureau of Economic Analysis. Exports rose 0.6%, perhaps reflecting a revival of demand abroad, while imports gained 2.3% from a stronger yen by U.S. consumers for bargains from overseas. The Federal Reserve reported that credit card debt declined in January for the first time in 11 months. Seen as a sign of consumer confidence, credit card debt still remains 2.6% below its highest level of more than $1 trillion in April 2008. Consumer spending drives about 70% of U.S. economic activity. 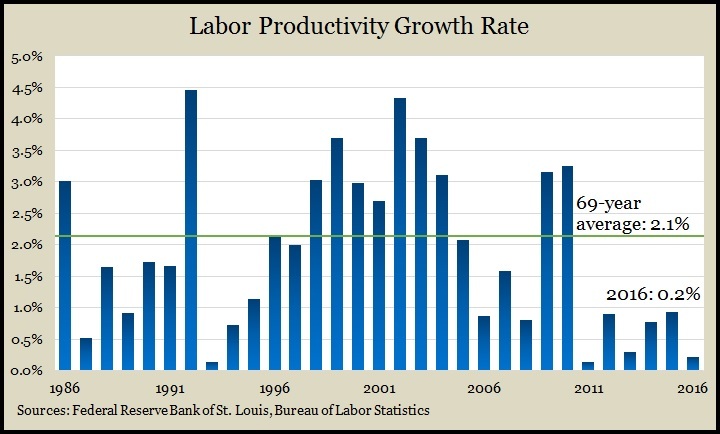 One of economists’ biggest concerns since the U.S. recovery from the Great Recession is sluggish labor productivity, which continued through the end of 2016. Slow growth in output per hour worked makes it harder for companies to boost profits and raise wages, which help fuel consumer spending. The Bureau of Labor Statistics reported that productivity increased at a 1.3% annual pace in the fourth quarter. For all of 2016, productivity budged 0.2%, the slightest gain in five years and a fraction of the 2.1% average pace since 1947. A months-long trend in stockpile cutbacks continued in January with a 0.2% decrease in wholesale inventories, according to the Commerce Department. Because sales at the wholesale level sank only half as much, the ratio of inventories to sales remained unchanged at the lowest level in two years. The ratio indicates how leanly businesses are operating, which remains near levels met toward the end of the recession. The moving four-week average of initial unemployment claims rose for the first time in three weeks after reaching the lowest point since April 1973. Jobless applications remain 34% below the 50-year average, according to the Labor Department. Another sign of employer demand, the persistent lack of jobless claims suggests companies are reluctant to let workers go, which should build pressure for higher wages and increased consumer spending. Employers added 235,000 jobs in February, more than analysts expected and more than the 208,000 three-month average. The Bureau of Labor Statistics cited above-average hiring in manufacturing and – amid extraordinarily warm weather – construction. Health care and professional services added jobs at a slower pace. The average wage rose 2.8% from the year before, a bit higher than overall inflation. 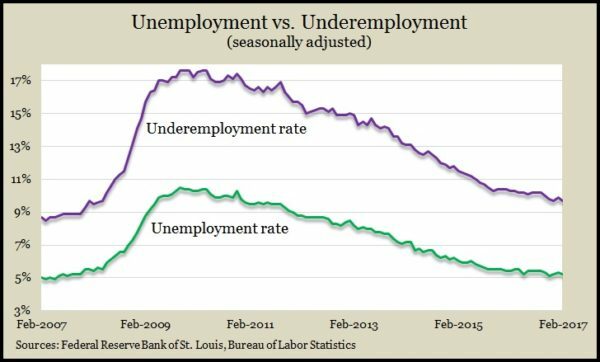 The unemployment rate dipped to 4.7%, remaining at or below 5% for 17 months in a row. Although unemployment is back to where it was 10 years ago, before the Great Recession, the U-6 underemployment rate, which includes marginally attached workers and workers who settled for part-time jobs, has yet to recover.